The nineteenth century was a major watershed in the Big History storyline in general and in the history of globalization in particular. This watershed is related to the modern Technological Revolution that brought profound changes to nearly all spheres of human life. 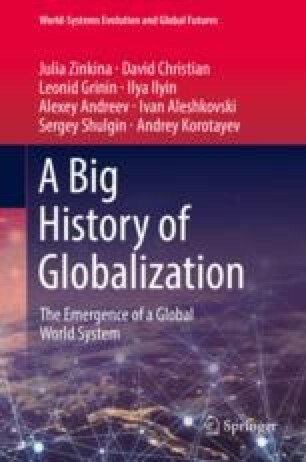 In this chapter, we will touch upon some of the changes that were most relevant to globalization and/or evolved into truly global processes that changed humanity. These include the Industrial Revolution, the changed patterns of global technological dynamics (the emergence of modern technological paradigms) and global economic development (the appearance of global economic cycles and global crises, as well as the impact of some particular breakthrough innovations in transport (railways, steamships) and information transmission (the telegraph). New technologies formed new material networks, which gradually spanned the whole world, leading global connectivity to a totally new level. These newly emerged networks were filled with new types of content, both material (e.g., bulk agricultural goods) and non-material (European-style modernity itself). The acceleration of technological development and increases in global connectivity greatly contributed to the World System core countries’ successful escape from the Malthusian trap. They also played an important role in the start of the global demographic transition, which encompassed the World System core countries in the nineteenth century.